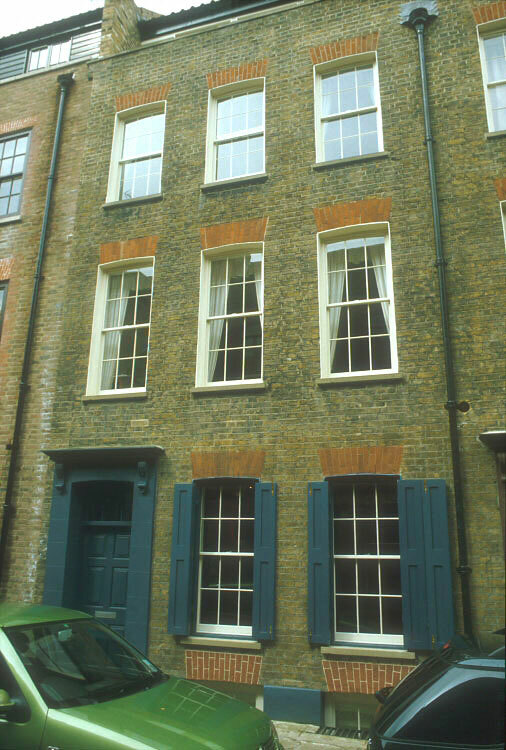 I had the idea that I would bring back silk and memories that would bind India to a Spitalfields silk-master's house. 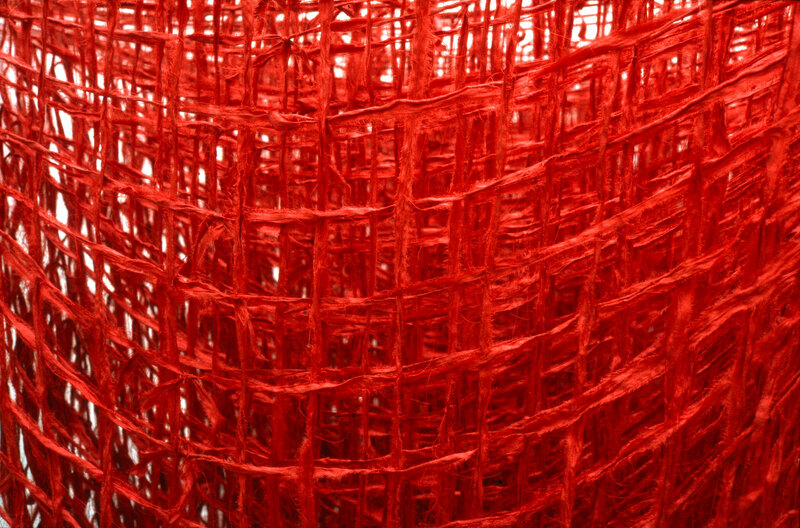 In the Meenakshi Temple in Madurai, in an enormous stone hall seemingly built by giants, a stall holder - under a black statue of Kali draped in an emerald sari - sold me 40 metres of red raw silk wrapped in a bin-liner and string ... bought as pouring rain was flooding the stone gullies and swilling the streets in manure. I tore the silk into strips, which frayed and tangled, and wove an environment like the cables that straddled every roadway and knotted their way round every telegraph pole. 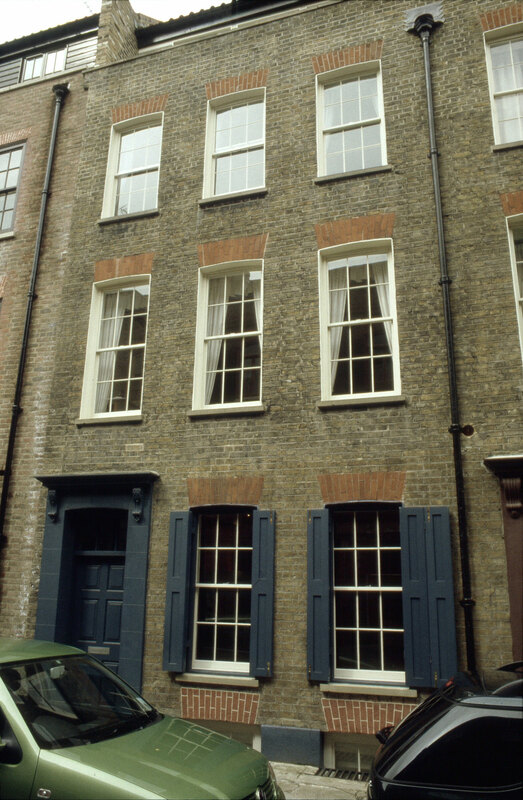 After its residence in the 'Five Princelet Street Gallery' - part of the converted ground floor of a silk-master's house, Silk was reinstalled in the adjoining 3 Princelet Street, an unconverted silk-master's house. Number 3 is a private house whose large street-level unshuttered windows afforded direct viewing of a small front-room, a pink panelled wooden box used for 'art' displays (usually extraordinary flower arrangements). 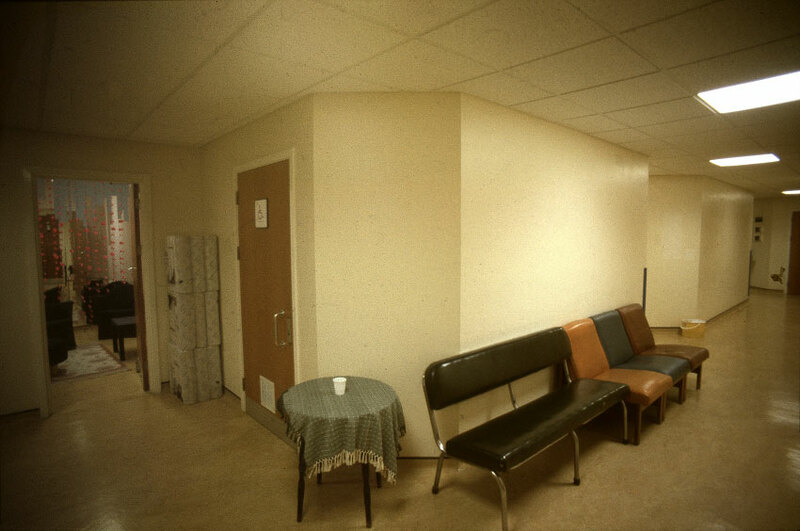 These houses rise straight from the pavement and this room was too noisy and public to use domestically. 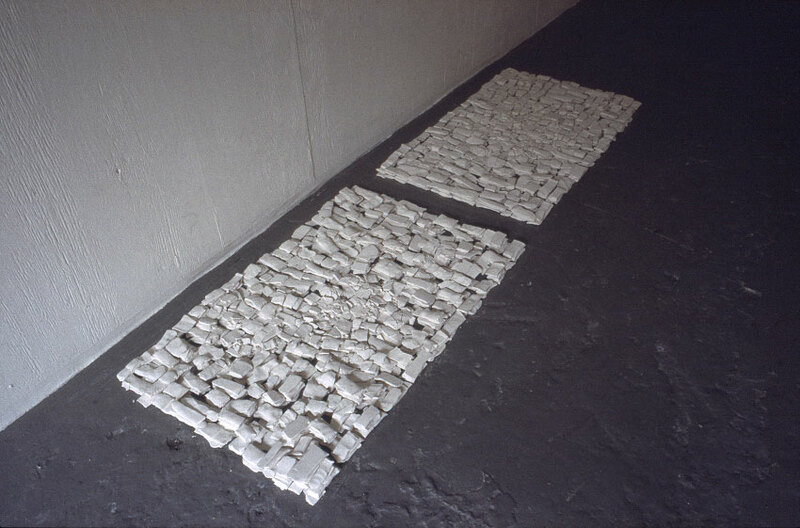 In it the piece was re-hung, differently of course: further off the floor, more 'helpless and captive', and lit at night to be viewed from the pavement by passing voyeurs (in Princelet Steet tourists always peer into these museum-like houses, wondering 'what lives here!'). 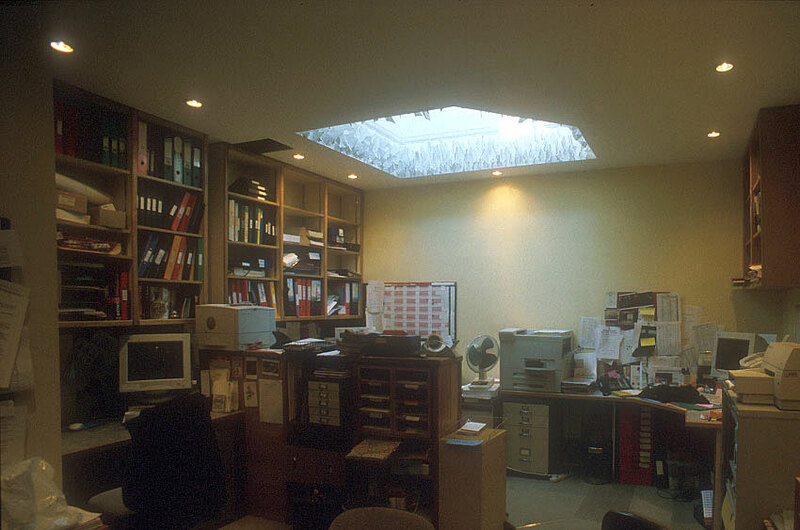 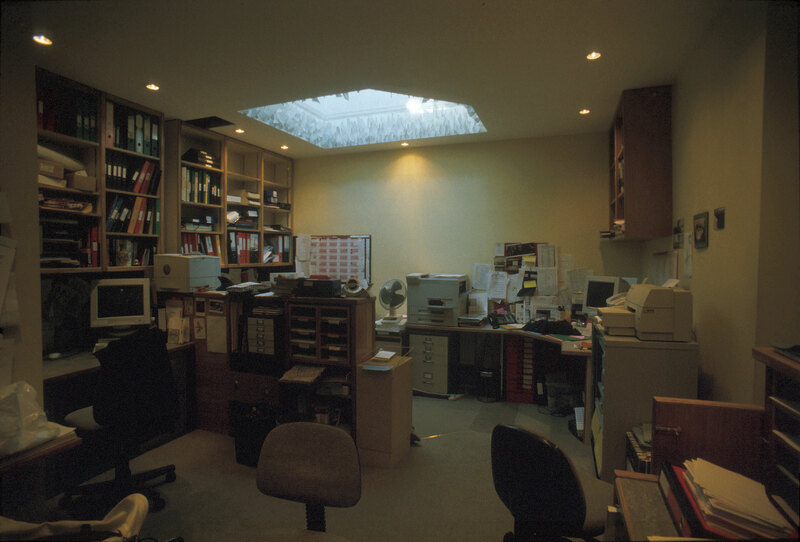 The only source of natural light into this office space was from overhead windows. 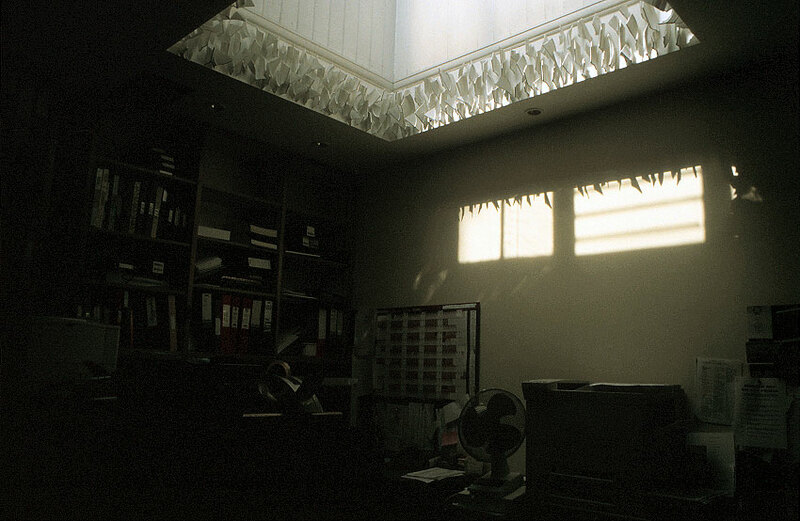 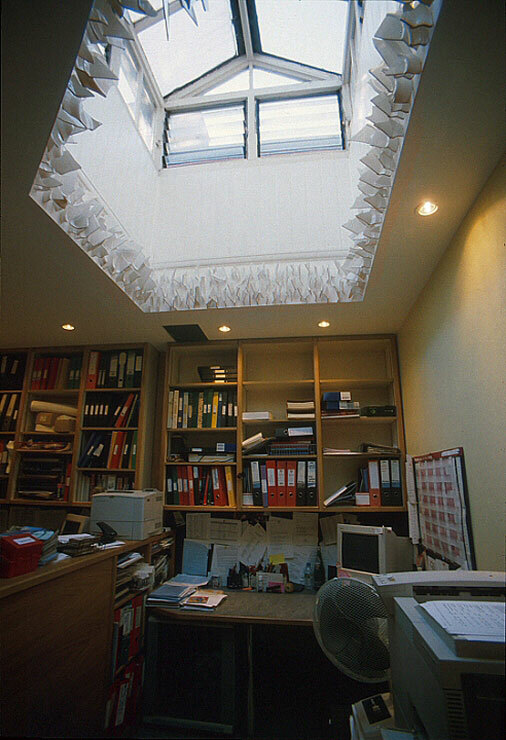 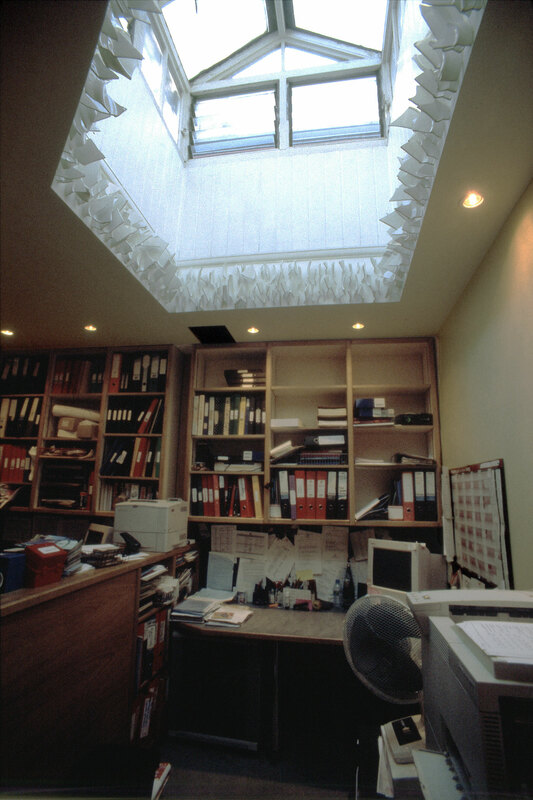 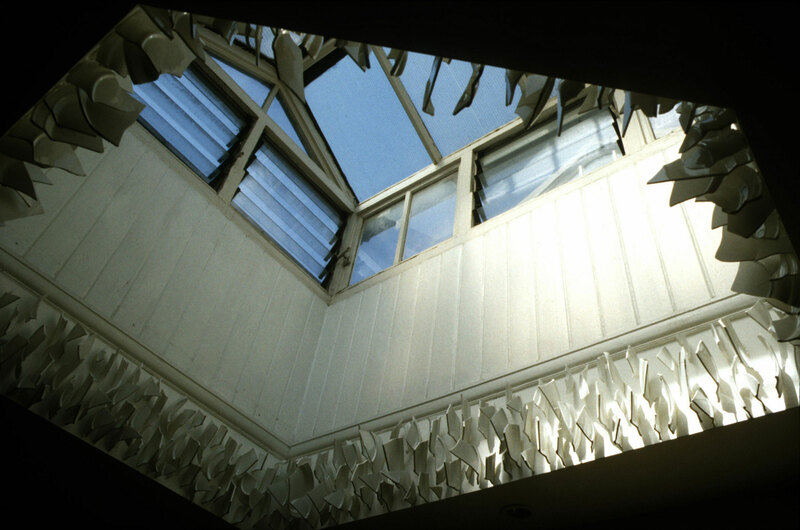 Here plate-shards (selected from the same group as "Inbedded") fringe the sky-light directly over the Admin-Reception area at the institution's public entry. 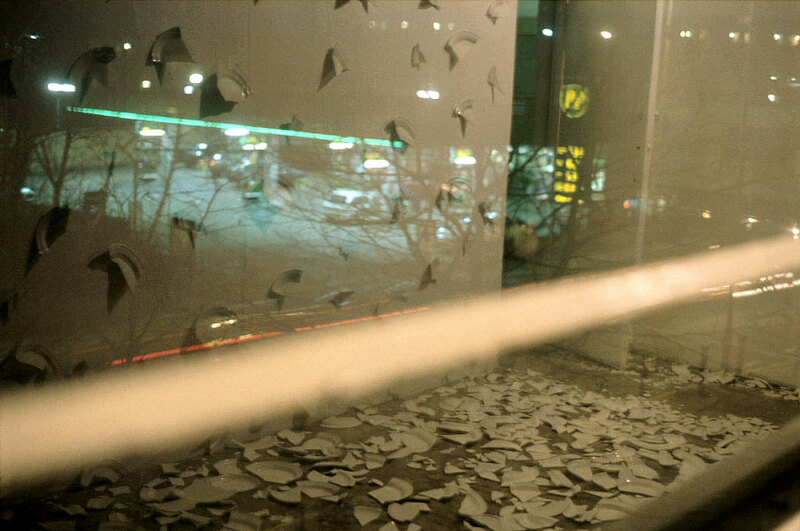 It had a threatening presence and thus - via an ensuing brouhaha - the life span of a may fly! 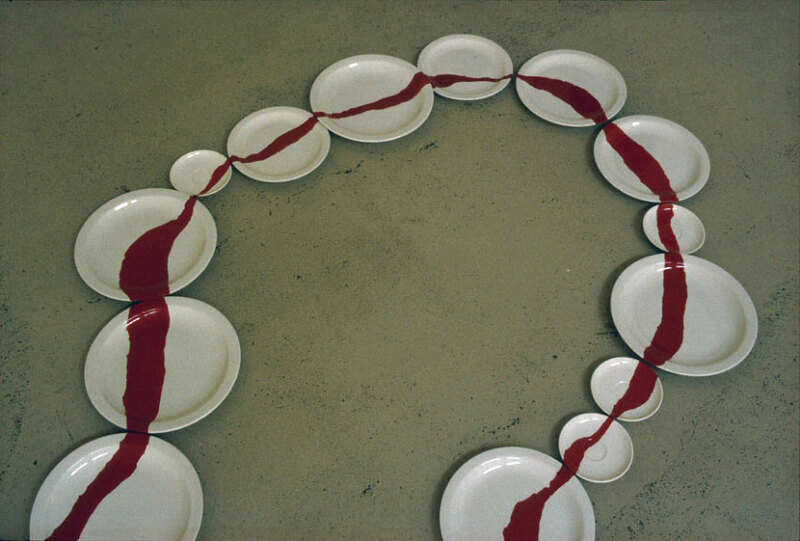 These plates with their red glaze stripe were made in response to my failure to conceive a baby. 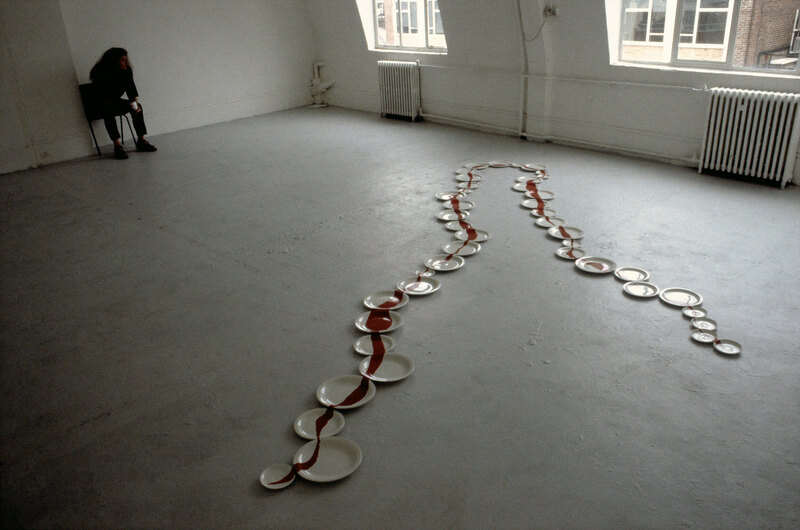 Their assembled shape relates to the location and their sequence is pre-determined by the stripe. 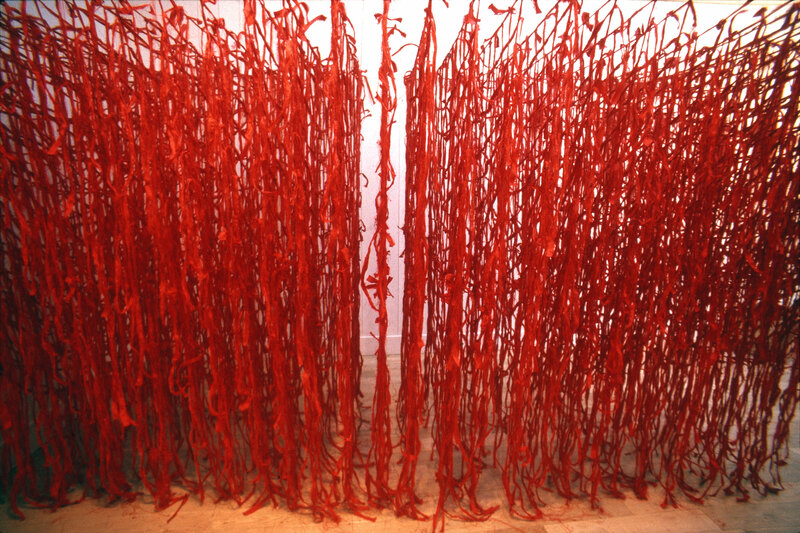 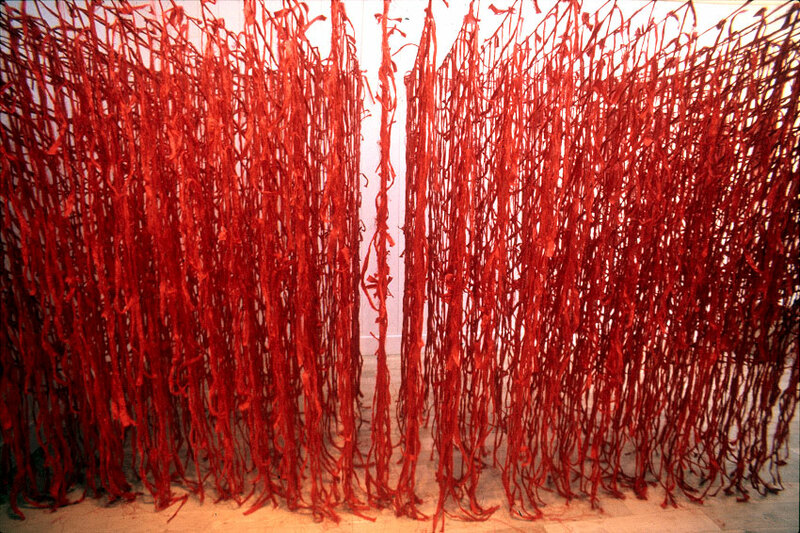 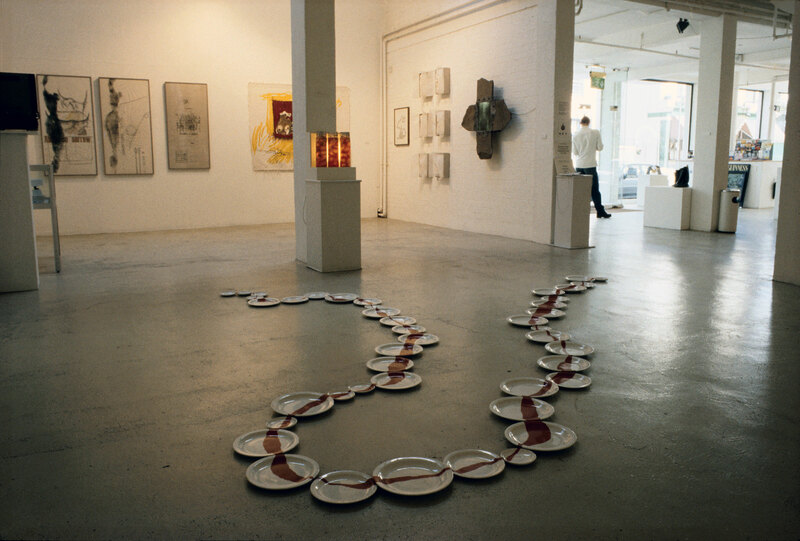 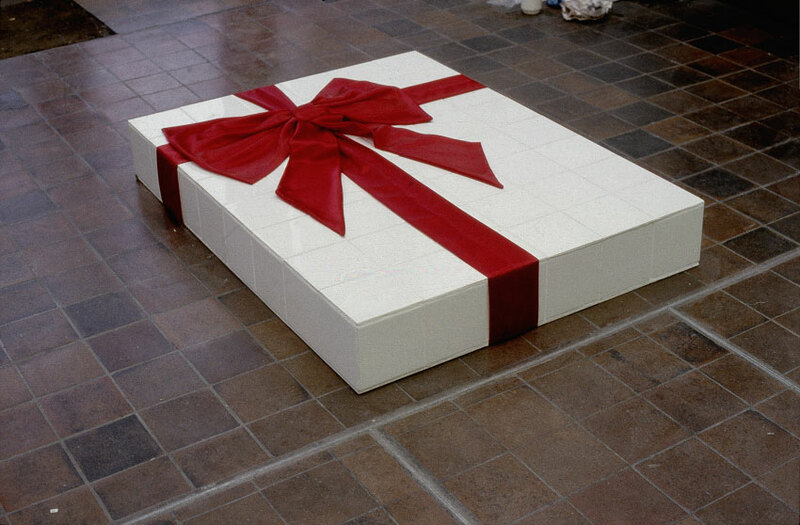 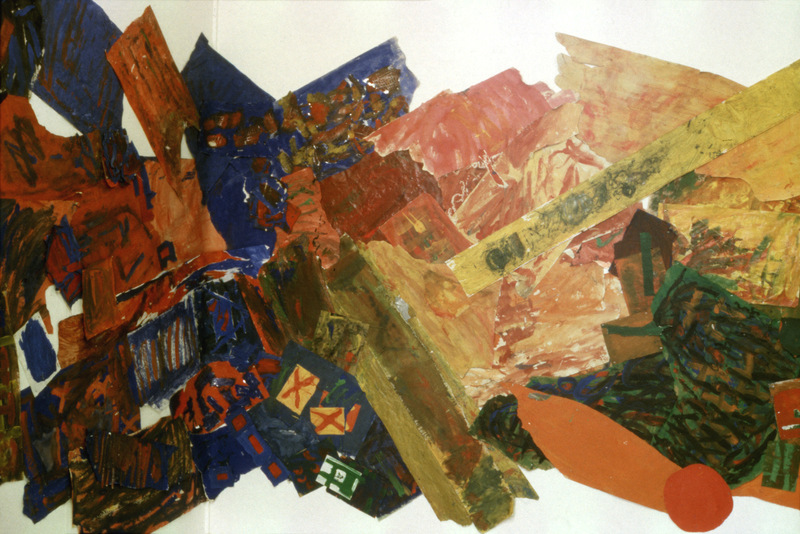 They were shown in a number of galleries as a floor piece (firstly Riverside Studios 1995 - see below), and most recently as a wall piece directly relating with others' works in Christie's Education, London). 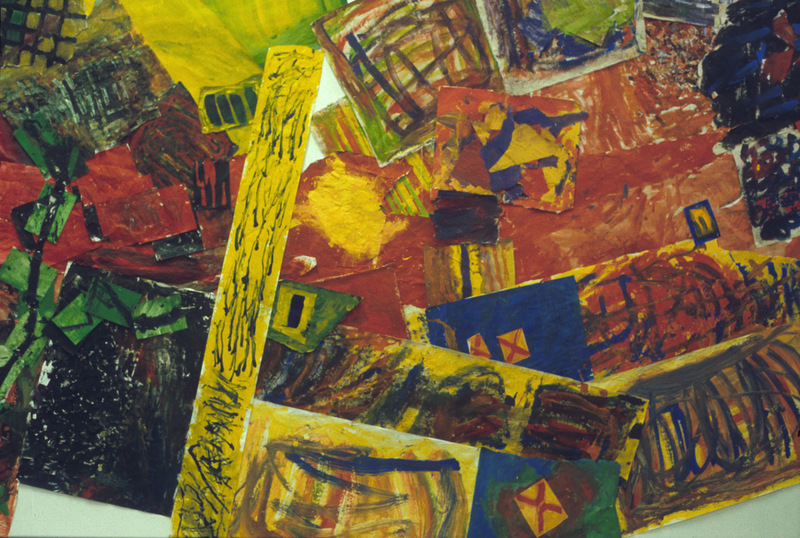 I taught an autistic man for 4 years. 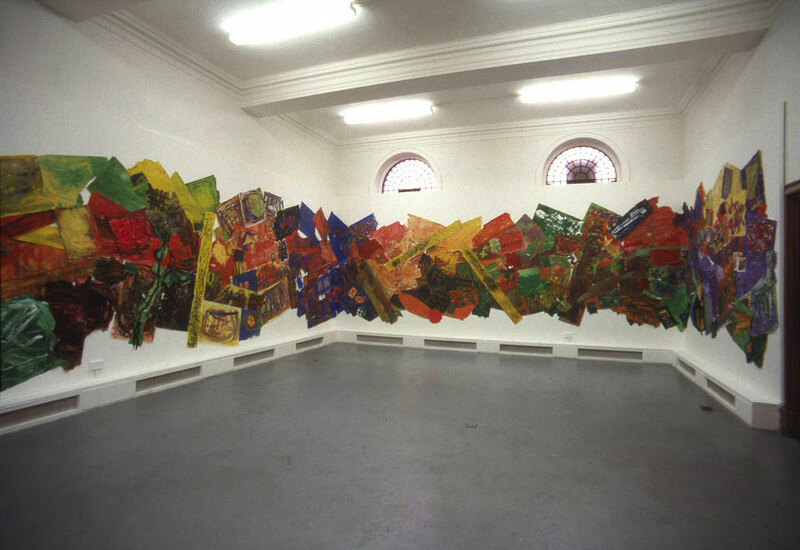 By 1999 he had produced hundreds of paintings. To celebrate his energy and talent I decided to use these paintings as the 'raw material' for a gallery installation. 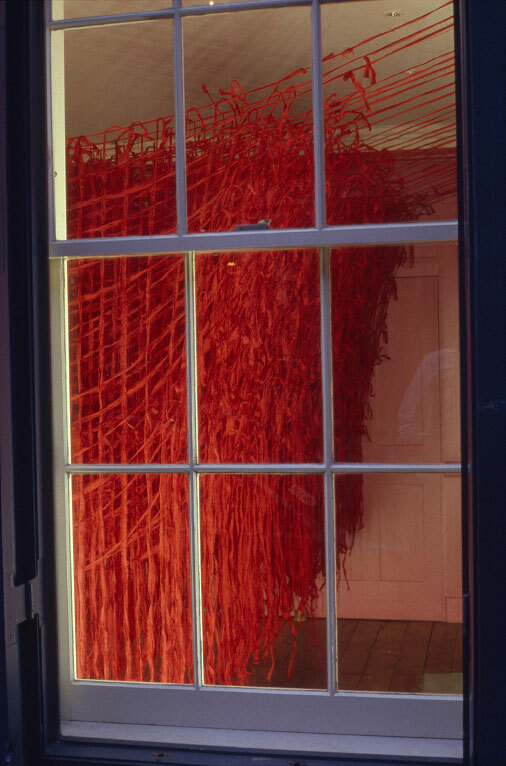 They manifest vigorous action and colour, and do not lend themselves to being framed and hung. 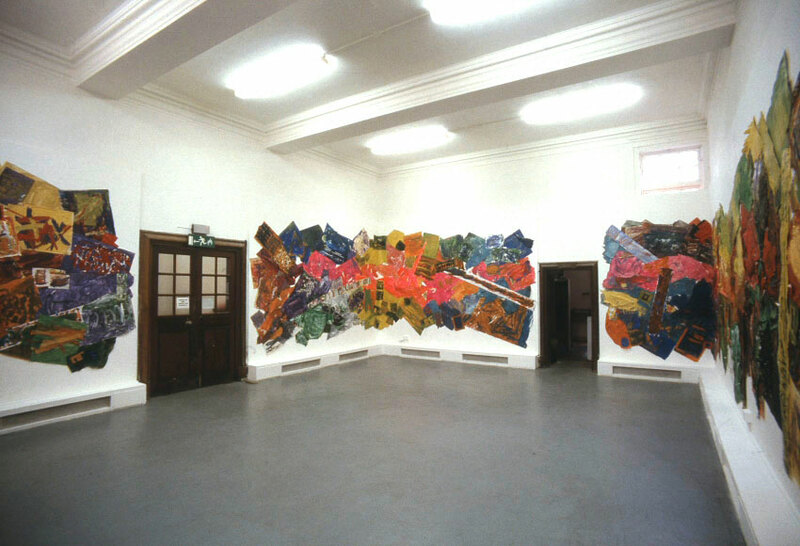 I used each whole painting as a 'mark' in a huge composition encircling the gallery walls. 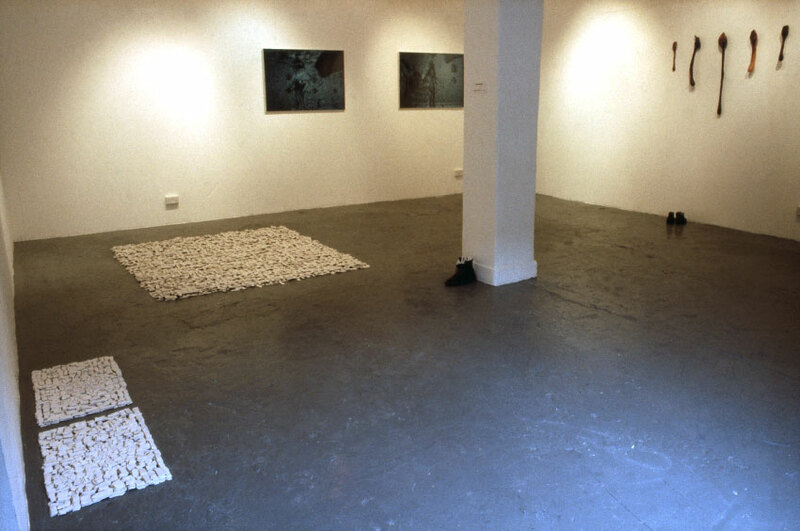 I worked on the installation in-situ like a 'painting', changing and rearranging it in the process of finding a definitive form. 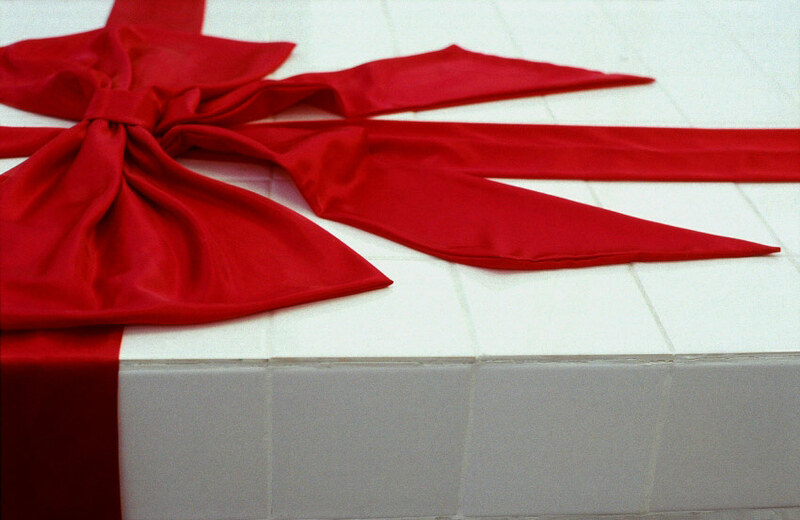 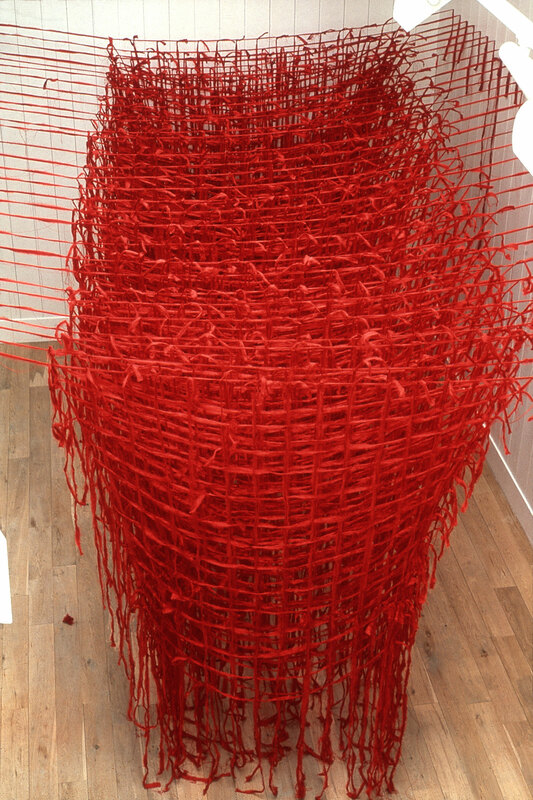 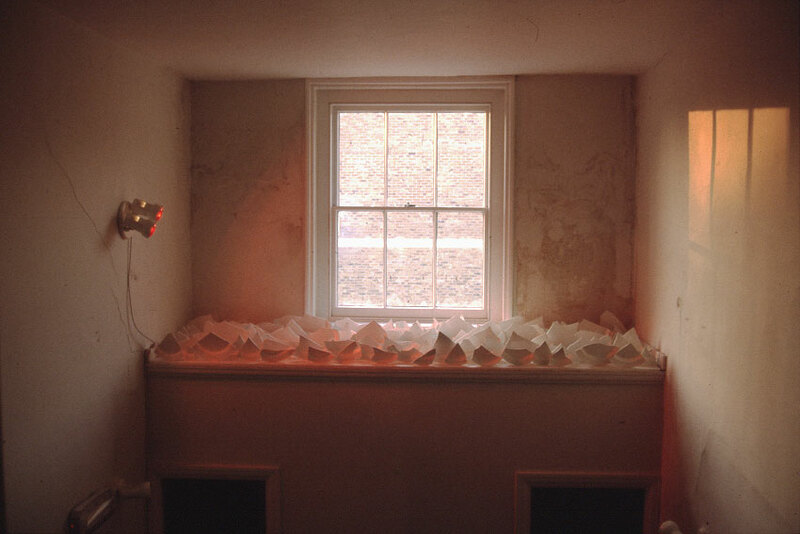 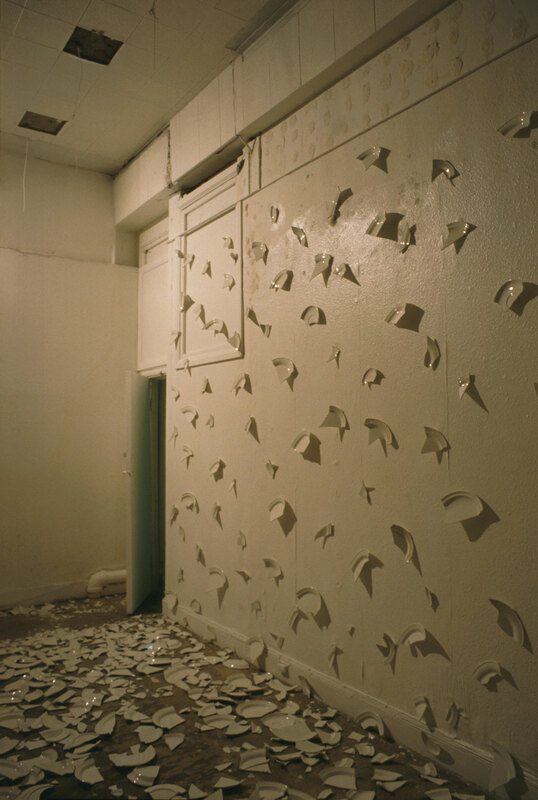 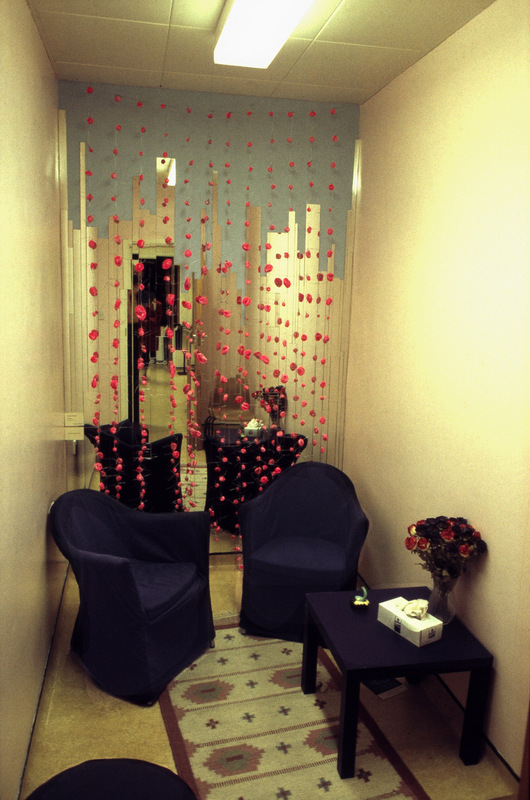 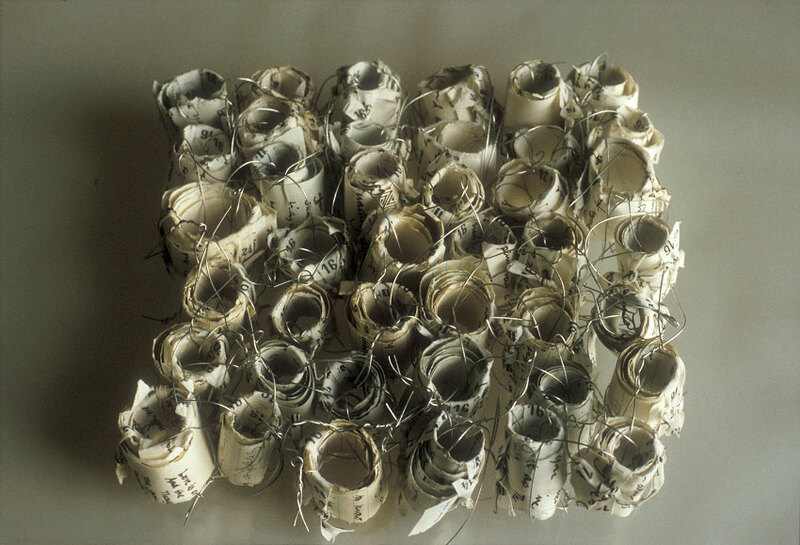 From 1995, in response to painful emotions and broken relationships, I smashed plates and installed the sharp shards in site-specific locations in buildings. 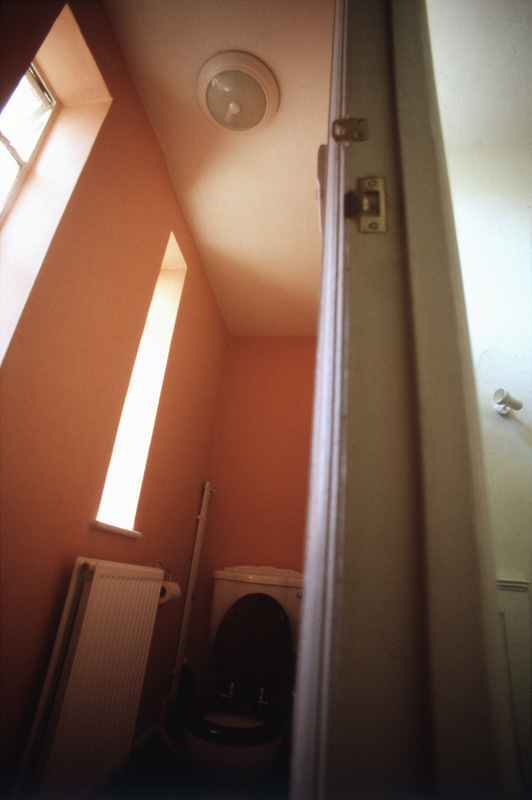 "Inbedded" covered the single-bed sized 'roof'' of the landing WC in a private educational building in Bloomsbury. 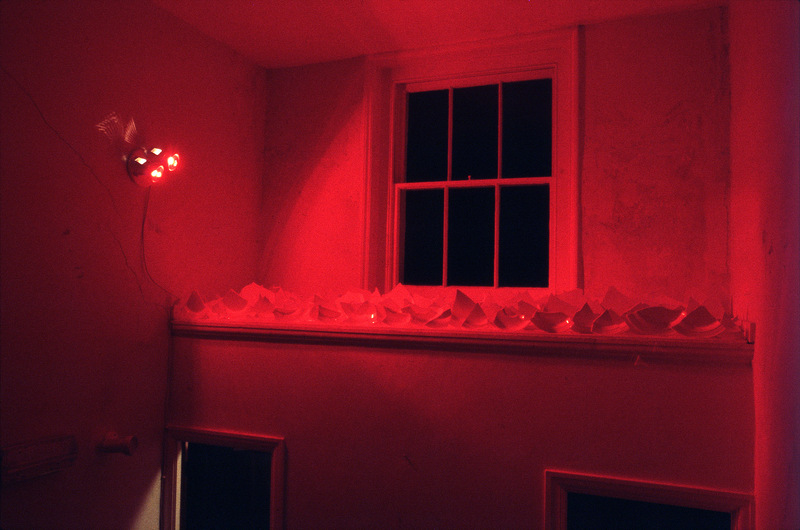 The piece changed through the day from a translucent rice-paper white glowing with internally scattered light, connoting a purity and beauty that was absent from its thick-carpeted kitsch environment; through evening pink, to a melting hot red at night signalling brothel-sensuality to the rich street through its high rear window. 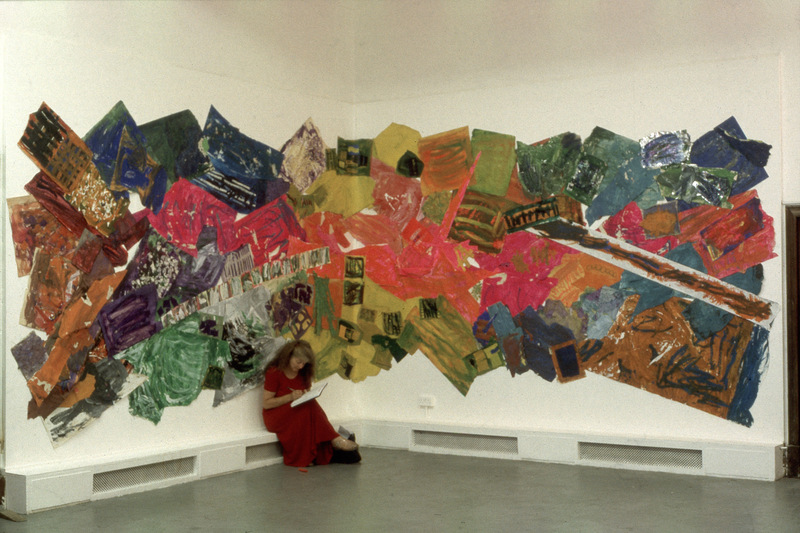 Prior to its opening the Tate Modern ran events that established its artistic presence. 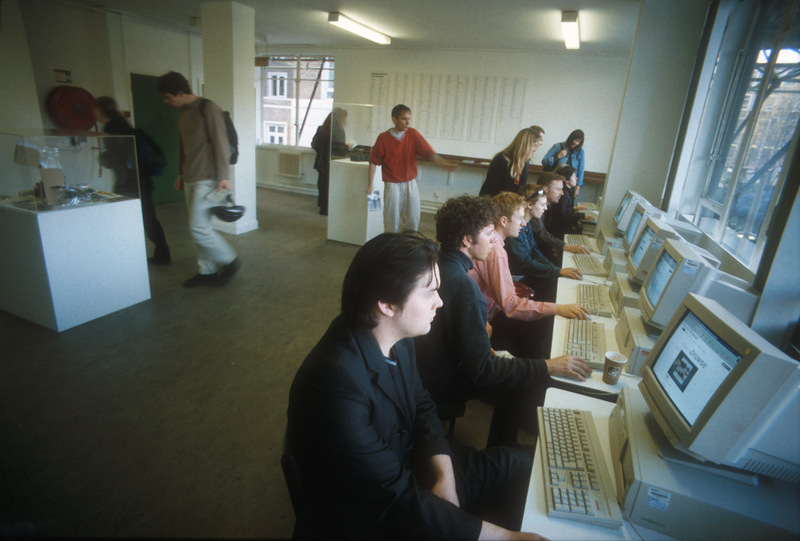 One such was the "Bankside Browser", an open archive that could be accessed physically and via the web. 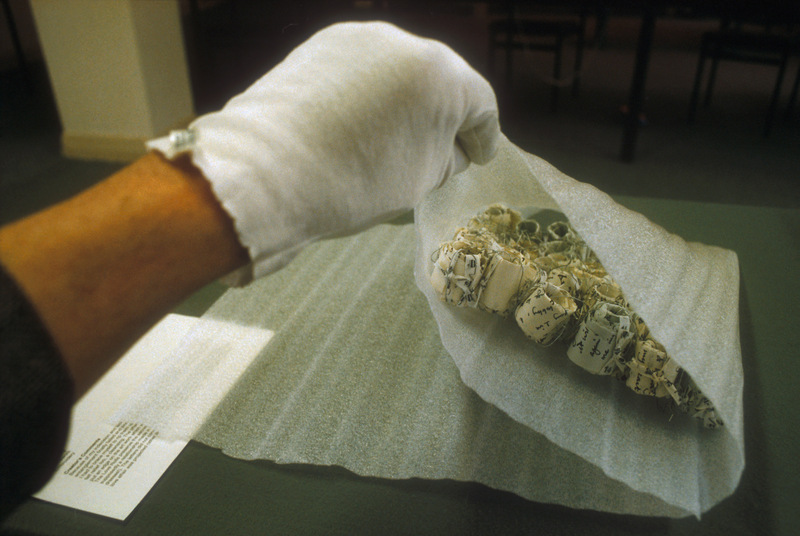 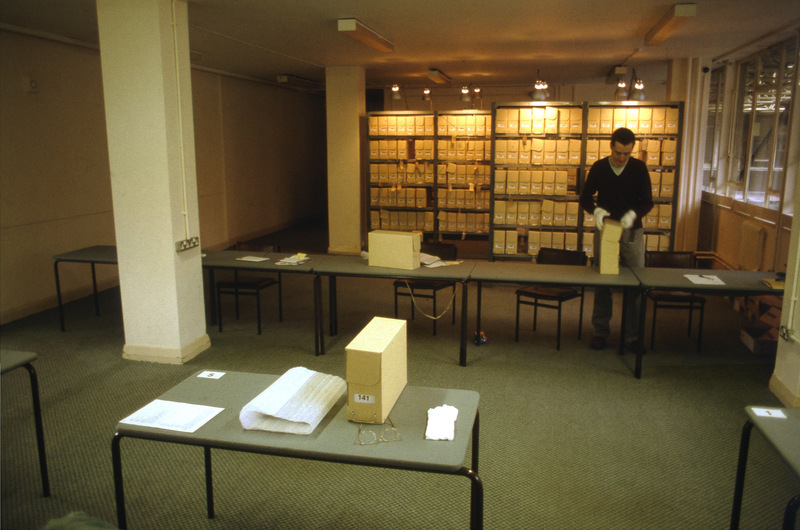 The brief required a work that fitted an archive box and could be handled by the public. I chose to work with love letters I'd received. 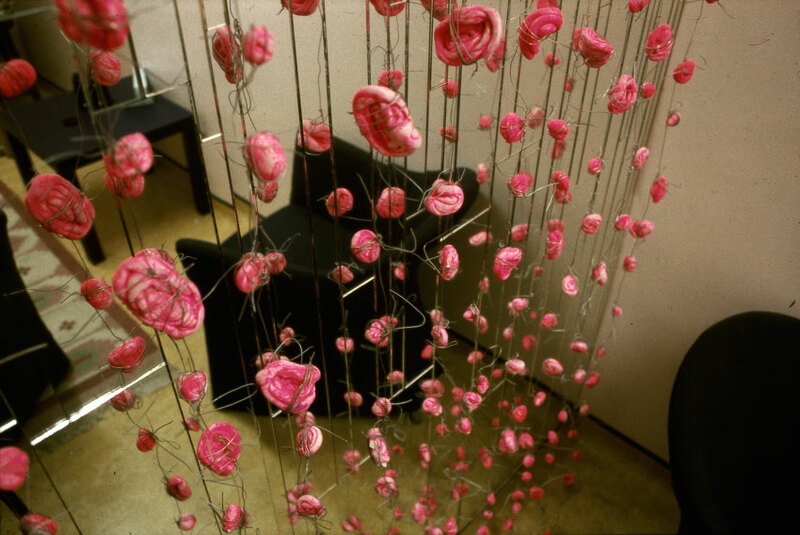 These were problematic to me - most of all I mistrusted their sincerity. 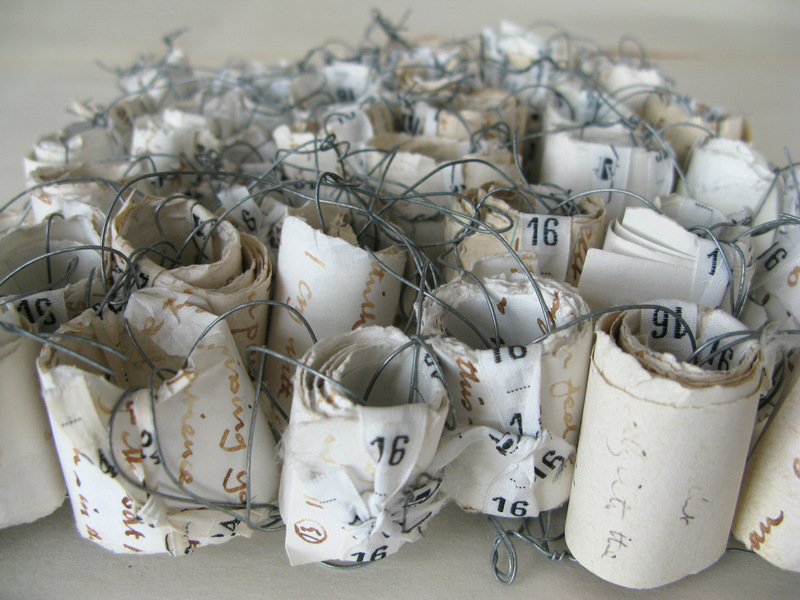 I tore them into strips and rolled them up, securing them with dress labels and pins (I was making wedding dresses when we met) and bound them all together with spikey wires. 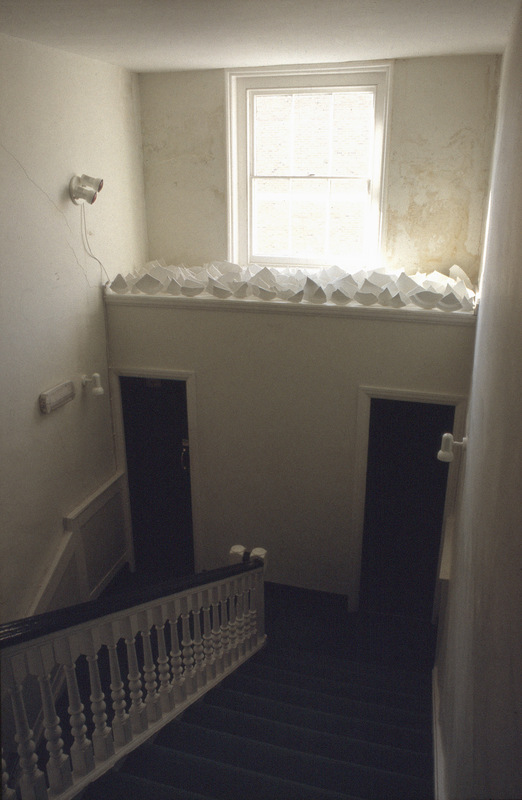 The visibility of the author's hand made me concerned that placing such intimate letters in a public place risked our friendship! 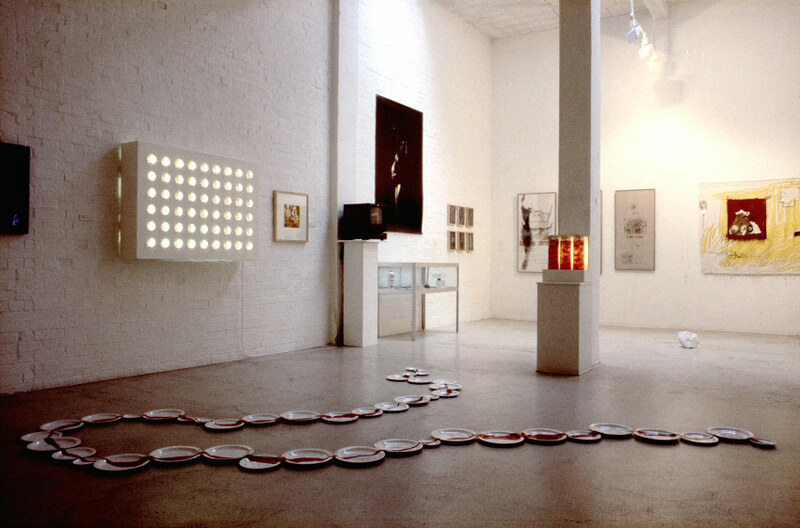 The Brouser event and archive seemed a remarkably suitable 'venue' for these letters - it diagrammed my ambiguous feelings towards them: the works it sheltered and purveyed were held at a nexus of contradictons, where things were safe in secrecy; in a state of hidden potentiality; chosen for direct apprehension via a system of obscurely conveyenced alternatives; released for a limited and tightly controlled exposure. The counselling room was drab small windowless - the most unsuitable place to be given bad news. 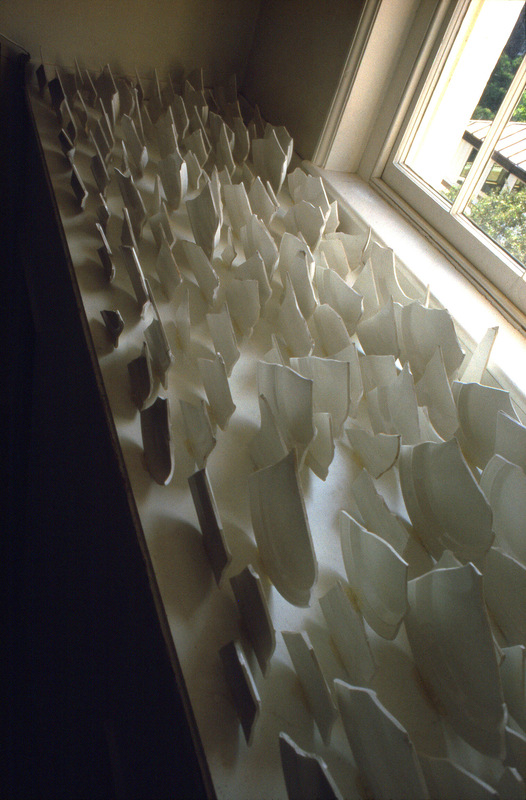 I changed its furniture and colour, and on its end wall assembled mirror-glass off-cuts to give a sense of depth breadth and light. 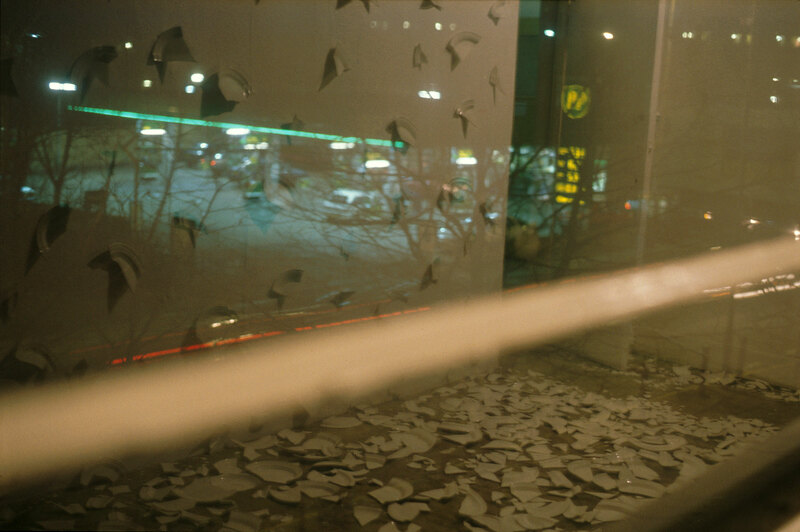 I wanted to provide the missing window - the glass evoked an imaginary townscape view. 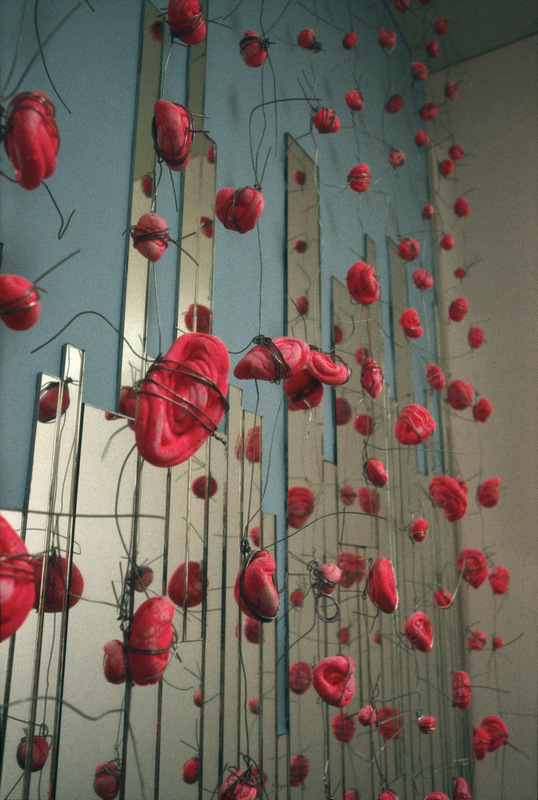 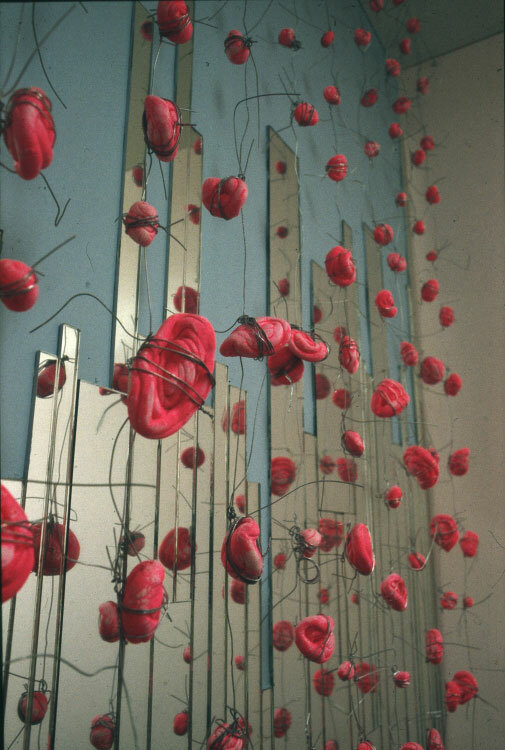 To ameliorate the harshness of reflection I overhung the mirror with strings of porcelain-clay 'roses' bound by and hanging on twisted wire - an image between pain and reassurance. 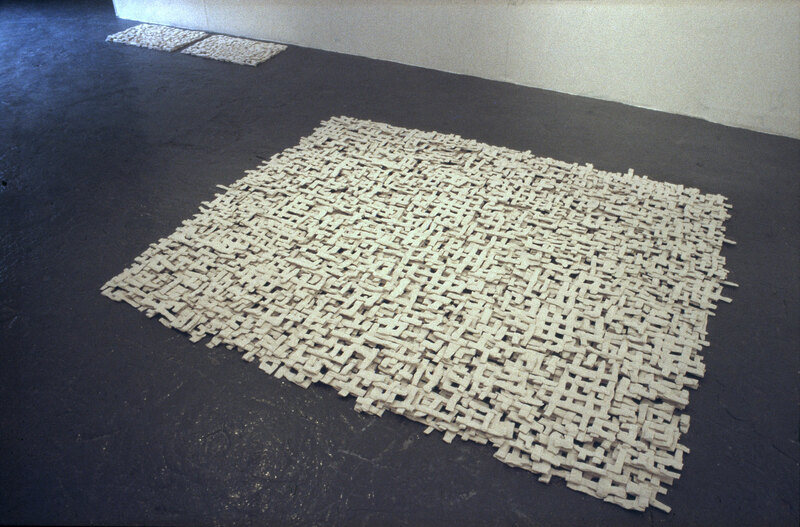 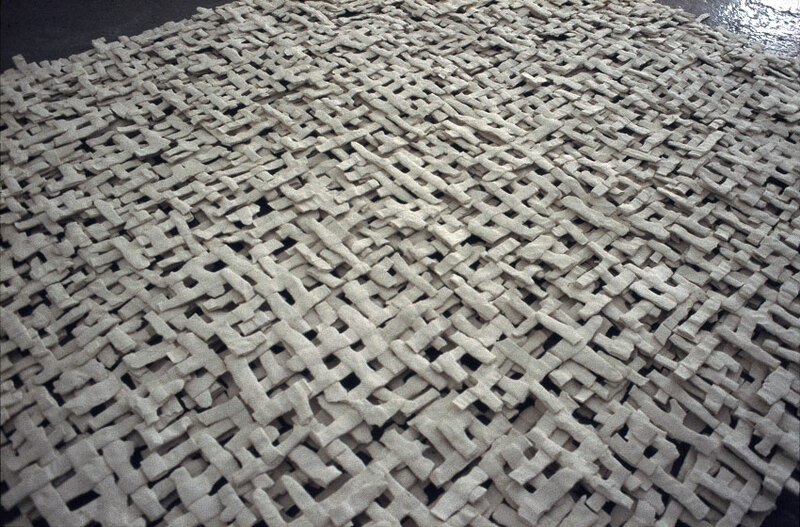 Economist Carpet" installation of 10-2001; followed by two other public works using the same (increasingly fragmented) clay pieces: Church Work (1) and "Overlooked". 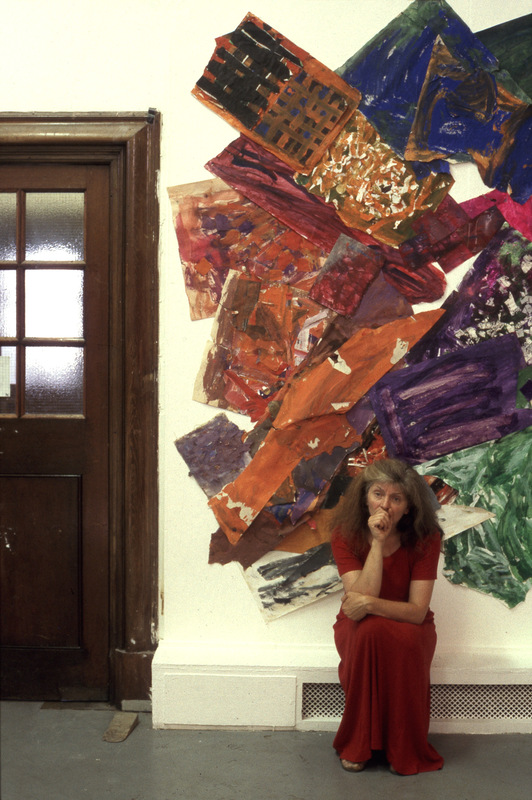 "Olive Morris House" was an empty commercial building near Camberwell Art College and the South London Gallery. 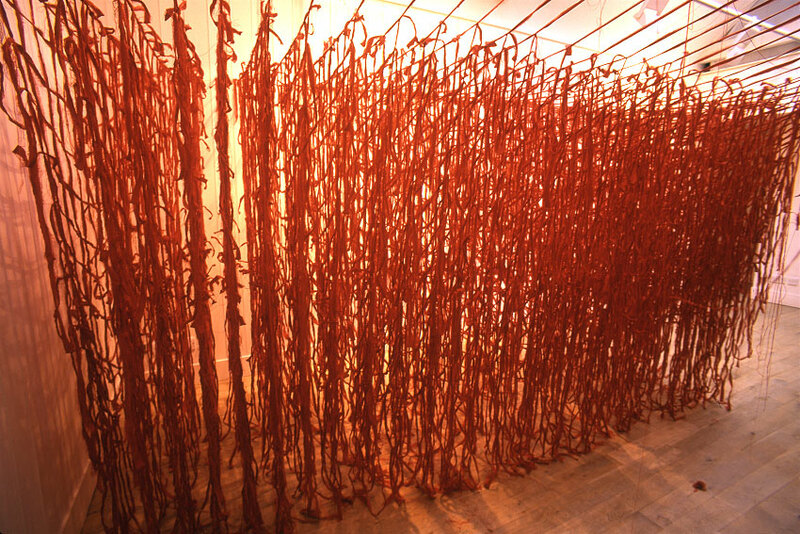 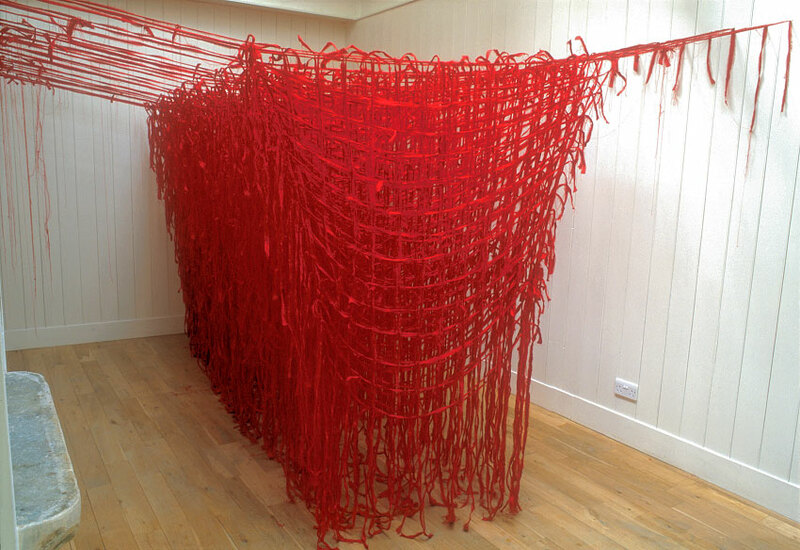 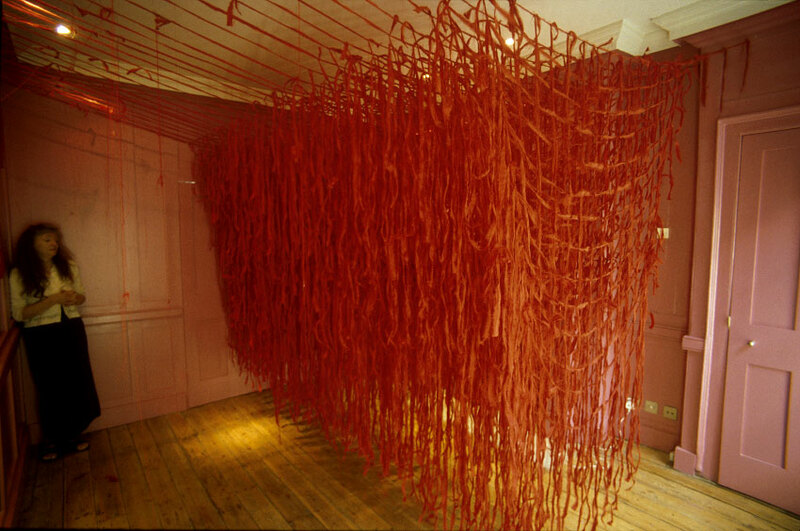 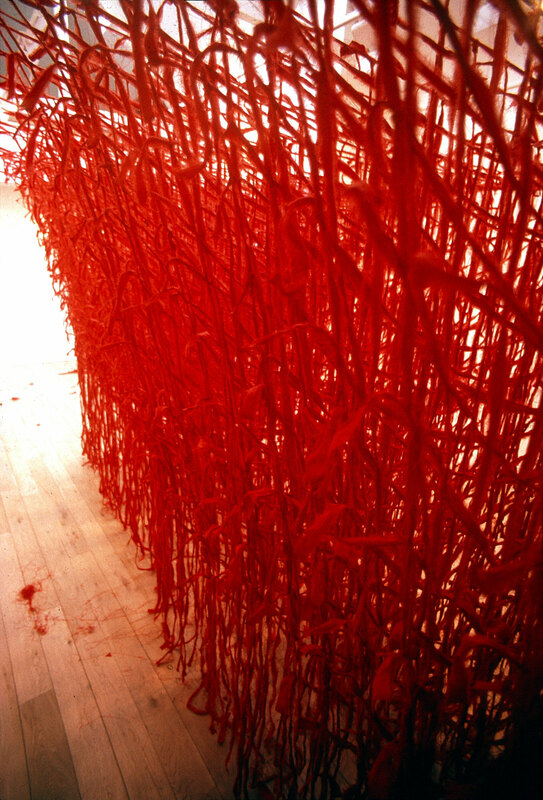 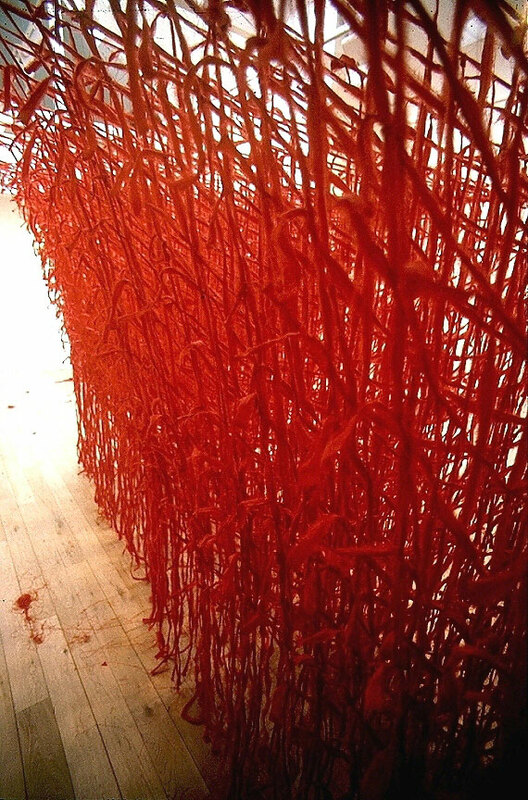 Angela's room-installation was part of a large exhibition, organised by the South London Gallery, that utilised its large warehouse-type spaces and office rooms. 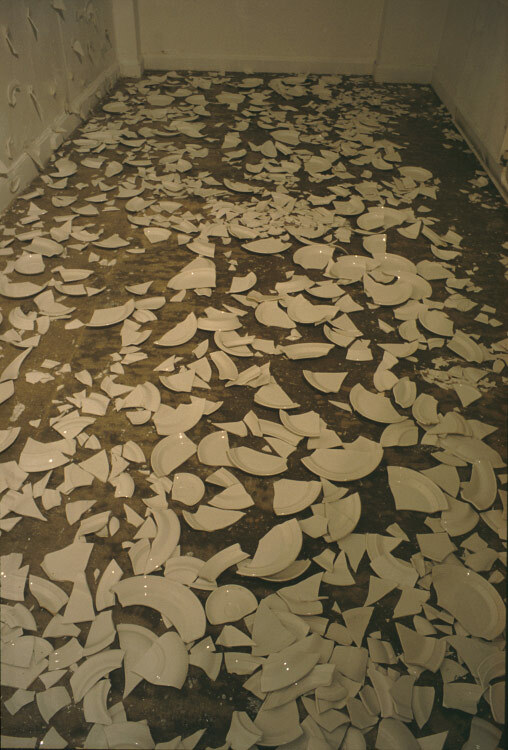 At this time Angela was using shards of smashed white plates "in response to painful emotions and broken relationships". 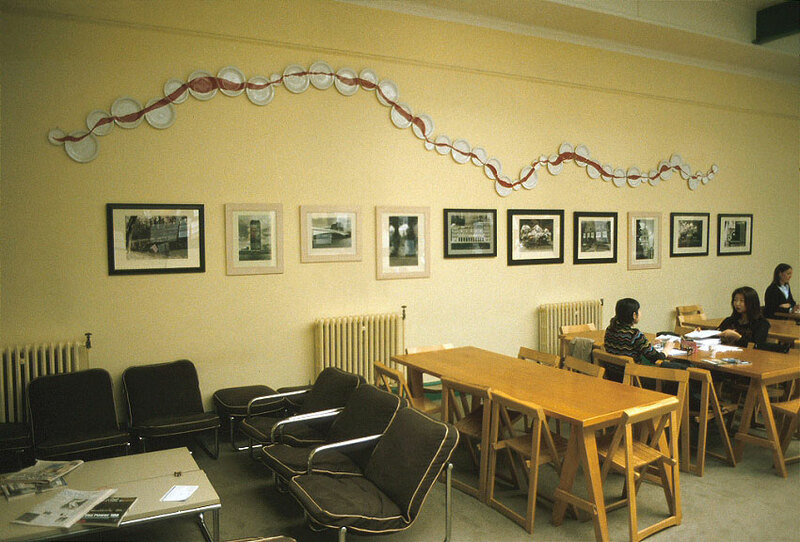 Angela rented a studio in the "Conductors Hallway" complex (an ex bus-station). This object was made for the inaugeral exhibition in its new display space. These plates with their red glaze stripe were made in response to my failure to conceive a baby. 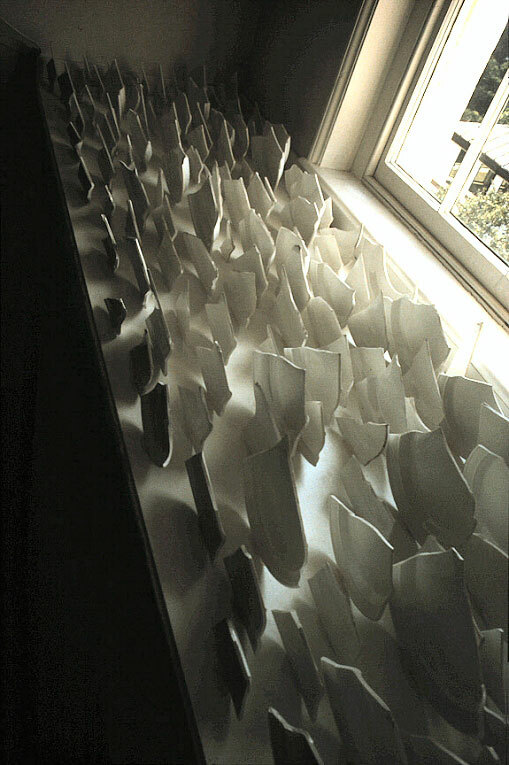 Their assembled shape relates to the location and their sequence is pre-determined by the stripe. 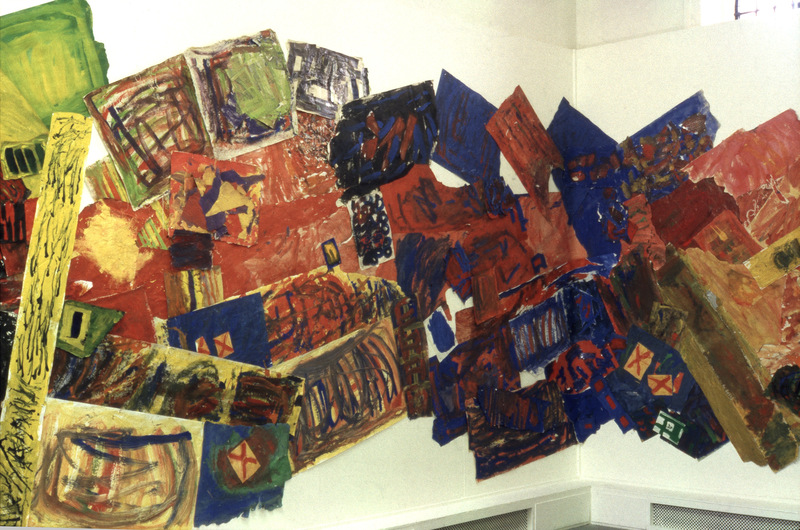 They were shown in a number of galleries as a floor piece - firstly in Riverside Studios, then South Hill Park, Bracknell, also in St Martins School of Art, and most recently as a wall piece directly relating with others' works in Christie's Education, London (see above).